Every Saturday and Sunday from 12-6, shop the works of local artisans at the Market at Dat Dog! One of the best art markets in town is hosted in our very own courtyard on Magazine Street. Check out @themarketatdatdog on Instagram and Facebook for more information about who's vending each week. *Please note the Market will not operate March 2-3 due to Mardi Gras, and will not operate Saturday, March 16, due to the Irish Channel Parade. 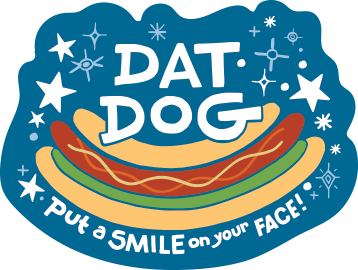 Dat Dog on Magazine Street will be open for normal business hours those days.